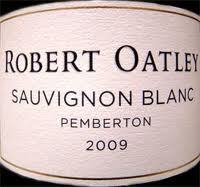 Came with a collar proclaiming the enviable Robert Parker “over 90 points” benchmark. Yes, a 91 point wine under $30 in British Columbia; shocking but true. 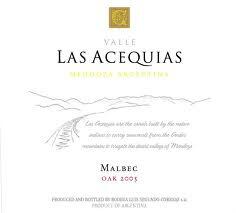 Well, I have to give the chairman his due: This is one easy to drink and a lovable Malbec. Smooth and fluid and rich and delectable. Not much to complain about except, once or twice, wasn’t sure I was actually drinking wine as opposed to nectar. Not big and bold enough to stand up to, say, a roast leg of lamb, but ideal and perfect for BBQ and (as we had it) with simple roast chicken and vegetable salads. Market Liquidity: Easy like Sunday morning. The PG vogue (which has permeated it seems every social function on the planet) has been gently mocked by 30 Rock, where it’s been Liz Lemon’s go-to quaff (or, simply, white wine with ice and sprite). 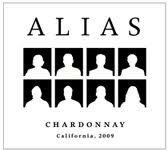 In other words, flat and tasteless, yet a marked preference over SB or chard. But although there’s plenty of dross there’s some finer PG too (just, unfortunately it seems, a much higher percentage of dross and I noticed looking at the archive on our blog we have never found a PG worth posting a review about). 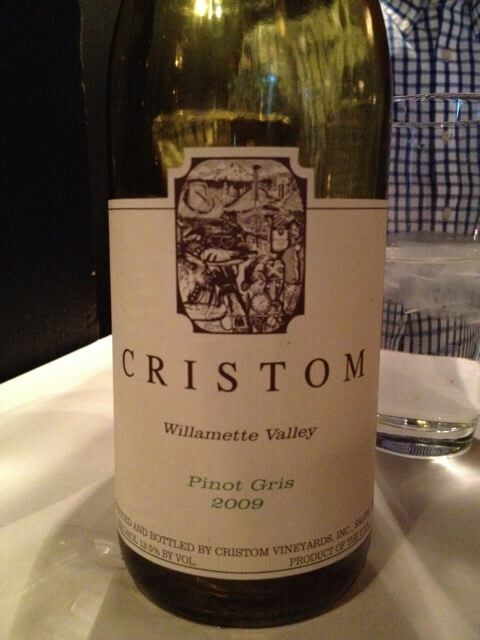 We shared a couple bottles of Cristom PG while eating Greek in Portland’s Pearl recently. Before dinner it had floral notes and some pear flavour, as lively as some mediocre Viogniers, but was more citrus with food and a little less full flavoured with vegetarian and fish mains. Still, for all of us a pleasant PG that had a little more character than the usual BC versions but still not star quality; would definitely order it again—and, indeed, it wasn’t hard for us to get two bottles down. Price: $28 USD in a restaurant. Market Liquidity: Decent but not delectable. 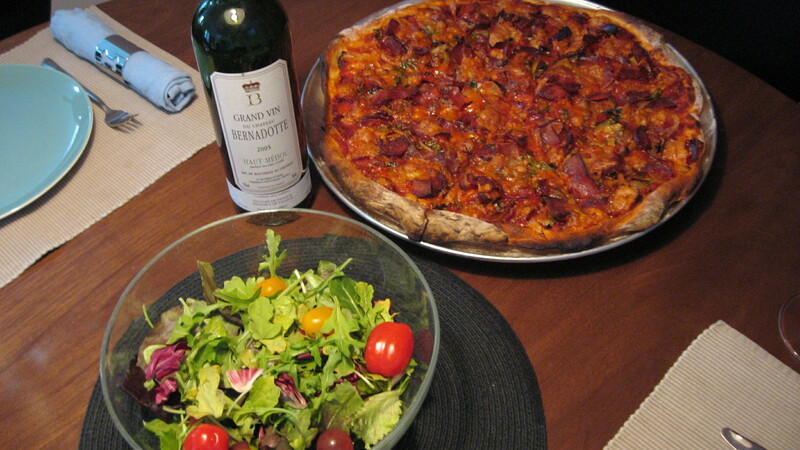 So after we got through the Pithos Bianco (reviewed here) we ordered a bottle of montepulciano which wasn’t that expensive and which we just wanted for some pizza and braised pork dishes we were sharing. 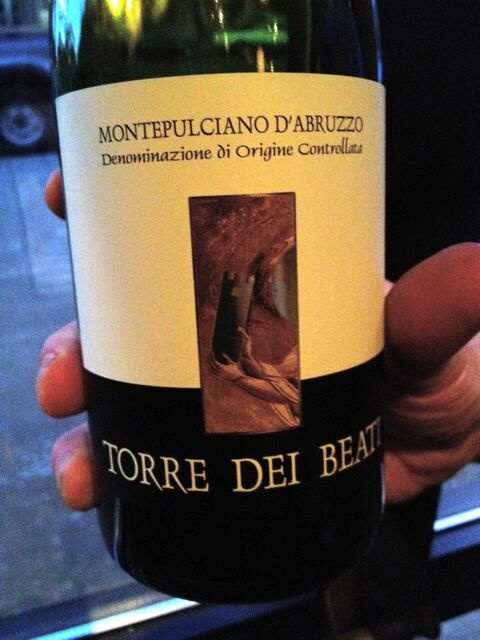 There is in BC a lot of cheap montepulciano and it can be hit and miss; not something I usually test the waters on. But the waitress recommended it based on our orders. Was it heaven on earth? No. Was it perfect with casual food and friends? Absolutely. Extremely food friendly. Sort of an Italian take on Merlot-for-Dummies, super easy to drink, smooth and likable on the first sip. Not a lot of dimension and hard to discern the deep flavours concordant with the deep colour but what a pleasing simple wine for easy going restaurant fare. If wine is as much context as viniculture then this bottle was just as good as if we’d gone with the big guns. Price: $29 USD in a Portland, Oregon restaurant. If you follow foodie trends there has been a recent push to get consumers to revisit classic Italian whites, such as Verdhicchio, as well as the not so common wines from COS. 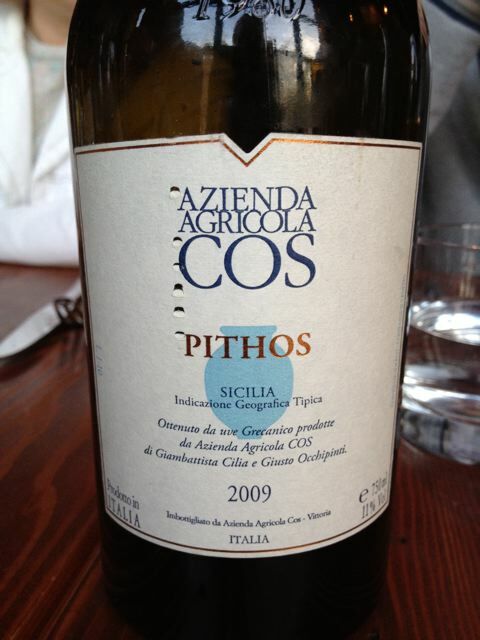 Although hard to come by in our Canadian provincial system, we had a bottle of white Pithos at a Portland restaurant this month. While the best white wine we had in a long Italian trip two years ago was hands down Sicilian white (true, better than many of the “star” reds, better than some Barolo even), this bottle (unusually shaped and a little cryptic) was, well, quite unexpected. First, none of us had ever drunk grecanico (which is apparently the same as garganega, another lesser found Italian wine in our parts). The colour was a deep golden hue, the wine was fat and a tad syrupy, with some straw, nuttiness and a little citrus and absolutely bone dry, lip tingling dry. I would imagine this would be the perfect bottle with some fresh, and slightly oily anchovies or a garlicky aioli, on a deck overlooking the Mediterranean on Sicily in the heat of summer. Kudos for 11% alcohol. But it was also awkwardly old-fashioned, as though it had been made this way for a century or two without a note of alteration and it had, how can you put it, a one-note character that never opened up or really made it palatable. We agreed that maybe had it been blended we all could have liked it just a tad more. Price: $39 USD in a restaurant; not available locally. Market Liquidity: More curiosity than keepsake. Mamma Mia! La bella Brut. I say this Brut is the best damn prosecco you’ve ever tasted, an exceptionally good California sparkling, or just OK bubbly. No matter how you cut it, I would buy this pear-tinged well balanced sparkling by the case. Did not and could not maintain its sparkle however and from the first pour belied itself as a contender. However, it was phenomenally rich and elegant and drank like a dream, no dry pasty overtones or too-sweet carbonation. A spicy bite, some intriguing cassis/currant flavours, but a very weak finish, nothing lingering or remarkable. Fuller with food than sipping, and a note of vanilla against dinner, but also a very forward alcoholic note, clinical or medicinal. In a very old school style there was an unmistakable “bouquet”; nothing New World about that and, for us, just a tad too floral. We corked a third and it was better the second night but while we found it unique and refreshing from the (sometimes) oppressive oaky California reds, it was also a little bit of a letdown, something thin and unmemorable especially given the anticipation. Price: No idea. Was there any cheap Bordeaux from that vintage? Market Liquidity: Too much novelty, not enough heart. If there’s such a thing as anorexic wine, this is it. Any thinner and you’d have American beer. Like a homeopathic dilution of Sauvignon Blanc—almost character free. Totally forgettable. And with that, link to this hysterical video of an emergency room in a homeopathic ER. Price: $23.85 at Legacy Liquor, where, I might add, there are far better options on the shelves and some pretty phenomenal finds if you have the coin. 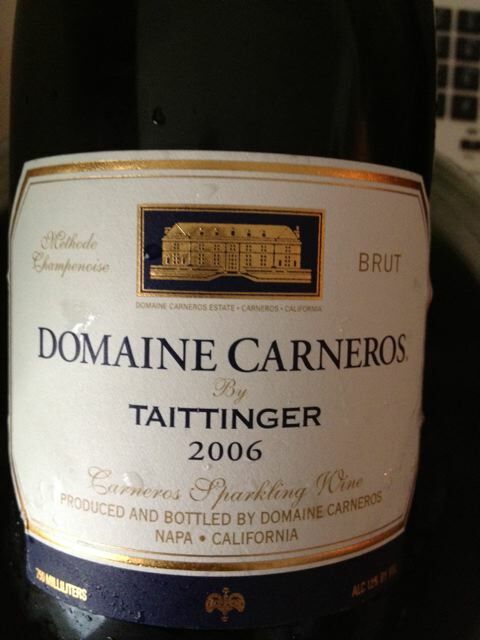 Market Liquidity: When the emperor is naked this is the go-to vintage. Price: $29.99 at BC Liquor, around $18.99 USD in Washington. Market Liquidity: Nice work if you can get it (under $20). Me: Wine for 200 Alex. Alex: The Washington vineyard that BC vineyards all aspire to be. Me: What is L’Ecole No 41. This wine is badly good. 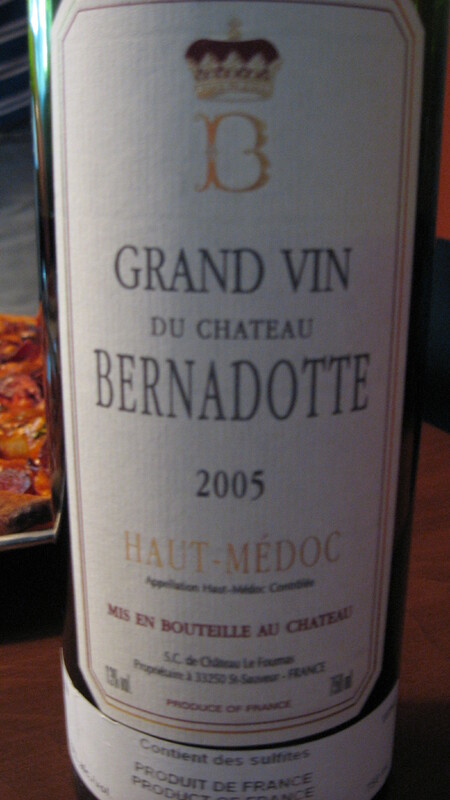 Not typically Merlot, certainly not passive, it has a tannic sting that softens to a rich, lingering finish. Oh so delicious. I served it with beef short ribs in a chipotle green salsa, although I would normally have served a cab sauv, or one of those pumped-up Ozzie shirazes, but this worked miracles. It sipped well too, but for some reason was phenomenally food friendly and just seemed to blossom with red meat. L’Ecole has produced perhaps the fullest, sturdiest, most uncompromising Merlot I’ve had in years. It has the stamina of something much more potent and is not the “wine for dummies” Merlot you might pass off on a vino novice. Elegant, impressive and just plain good. I beg Miles (in Sideways) to reconsider his misgivings about Merlot. Downside? Expensive. Actually, for me, for us, too expensive. It was a treat, a rare treat, but a rare find as well. Relatively speaking, this is up where the finer BC reds, the Cedar Creek reserves are, and if you paired it against, say, the $70 Vieux Pin Merlot it’s downright cheap (and much, much better). L’Ecole doesn’t have any pretense, unlike many BC houses… It’s also satisfying when you actually spend more to get something well worth it. Price: $50-plus, if you can find it. Market Liquidity: In the words of Kenny Bania, Gold. Market Liquidity: Ribbon for participation.